Ten years after founding their architectural practice, Mathurin Hardel and Cyrille Le Bihan decided to set up the consultancy MOX with Uriel Ruleta. Since March 2016, this independent company – specialised in site management and architectural site coordination – carries out the role of executive architect and validation of the architectural conformity of construction drawings and works for all Hardel Le Bihan projects. Two years on, Mathurin Hardel and Uriel Ruleta share the experience of their new organisation with all those wondering about the future of architecture and construction. In hindsight, what would you identify as the factors that led Hardel Le Bihan to create MOX? I can name five reasons and they are very varied. Firstly, after five years at the practice, Uriel quite rightly rang the alarm bell. He had joined us to reinforce the team at site phase, accompanying and training our young project managers. Until then this had been mostly done by Cyrille and myself. Even though we had very little site experience before our partnership. Despite graduating from the ESTP [engineering school specialised in public works]? I only worked for a year as an engineer for a structural engineering consultancy, before working on site management for Claude Parent. Cyrille had done a few, not many, with Moatti Rivière. We had sites for private apartment projects for the first three or four years of the practice. They were quite small projects so their administrative and technical management didn't really call for a specific structure. Uriel arrived just when we were shifting up a gear. Uriel Ruleta, what was your training? I qualified as an architect. I very quickly began working as a freelance architect on the site phase of projects, starting with Naud & Poux, then Ateliers 234, including coming to work for Hardel Le Bihan and continuing with other practices (Patrick Rubin and Babin-Renaud on a variety of different types of buildings). Although I did continue to work on design, time-permitting, being a site architect became something of a specialisation. Second reason. Uriel's way of managing and training our staff on site convinced and reassured us. We realised that, according to their personality, some project leaders proved to work well on site while others – despite being coached by Uriel – did not perform so well, although they could still be good design architects. The expansion of the practice and the size of our projects meant that we couldn't afford to take these kinds of risks, so the idea of building a team with more specific capabilities regarding site management became a requirement. Particularly if we wanted to be able sell our clients a site management service that met their just expectations. Another reason is the fact that the profession is evolving. We work more and more with private clients, exempt from the legislation that governs the architect's role on public projects. Depending on geographical distance and type of brief (offices or housing), our involvement for them is often limited to conception and monitoring architectural conformity on site, with a lightweight site-management service. Our concern is not so much the inherent loss of fee – the time not spent on site could be spent on other projects – but the loss of control over execution, a phase in which many things are still decided and which determines the success, or not, of the architectural project. The reasons given by private developers are numerous. Their primary reason is a lack of confidence in our skills for this stage of the operation. They worry that the designer, intent on preserving the architectural quality of his/her project, will not work in their interest, recommending services that cost more or take longer! They feel that the architect is not primarily concerned with completing on time and within budget. Consequently we realised that if we wanted to win back the management of certain sites and give a full service such as is legislated for with public works, we would need to structure ourselves differently, to show private clients that we had the skills to match those of the site architects already working for them. And so we decided to provide them with a company specifically created as executive architects, with an experienced and competent team. Cyrille and I are very short on time, and the complexity of site means that it consumes a lot of time (even when there isn't a problem!). In spite of Uriel's work, we were called on all the time. Without losing interest in our sites – vital to the success of our designs – we saw that a separate organisation would save us more time. Now he is independent, autonomous, does Uriel Ruleta have more weight with your clients? First of all this new organisation enabled a clarification of the different roles as defined by our respective contracts. On each project, MOX has one point of contact at Hardel Le Bihan, the project leader. On our side we only intervene on site when there is an architectural decision to be made. We no longer have any involvement with client, timing or cost issues. In the past I was a spokesman for the practice, whereas now I am a player in my own right, clearly distinct from the architects. There is no hierarchy between MOX and Hardel Le Bihan. We are complementary rather than superimposed. The final reason, implicit in the four others, is the aim for the architectural quality of the finished project. We now feel able to offer greater efficiency to our clients by working with a more specialised, better-trained team to ensure better results. At the same time, their capability leads us to believe that we can achieve better results with less energy and time spent. When is the decision made on the composition of the design team? On certain projects the contract terms are clarified right from the start, generally for residential schemes, where from the moment the competition winner is announced, the client expresses their desire that the same practice should see the project right through, or that an external party should be involved for the site phase. What does MOX do when Hardel Le Bihan is awarded a contract for full services? I should point out that this generally happens when a local authority or development authority insists that the developers give a contract for full service to their concept designers. It's reassuring to see that some development agencies still have confidence in architects. At that point we inform our client that an independent company, but one that originates from ours, will undertake the site management, which all our clients agree to. In fact it's an organisation that is a sort of half-way house between being contracted to supply full services and having a separate executive architect. What distinguishes MOX from its competitors is the architectural sensibility that they share with us, and which our shared clients benefit from. As Uriel and some of his team are architects, decisions taken on site jeopardise neither the architectural quality of the project, nor the interests of the client. Where that decision is made early on, does MOX get involved in the design phase? When this happens MOX is involved in the preceding phase (detailed design and tender package at least), and to check over all the documents so as to avoid any potential problems on site. Conversely, Hardel Le Bihan's project leader works alongside her/his counterpart at MOX, without confusing their respective responsibilities. Equally, we didn't want to double up on the architectural approval of construction documents; Hardel Le Bihan clearly delegates the administrative responsibility of this to MOX, with HLB's project leader being consulted where required – wherein the benefit of working in the same space. In both instances – full site supervision or simple architectural approval – MOX will undertake the latter as it requires the specific expertise that we possess. We are able to guarantee the architectural conformity of a construction detail well beyond that of the general conformity. In order to carry out this validation, we request all technical drawings, from shuttering drawings to ironmongery, which we then check. This is where we distinguish ourselves from what is generally practiced, it is our real plus. We always have MOX at our side, even when they don't have the contract for full site supervision! When Hardel Le Bihan has not been contracted for site supervision, how does MOX get involved? We tell our client about them and about the relationship between us, without interfering further in the decision-making. And MOX is systematically consulted to quote for the service. Sometimes they get the job, sometimes they don't. The structure establishes a bid that is certainly competitive, but that maintains a financial equilibrium. These consultations concern projects whose complexity requires specific site-management experience (office buildings, major renovations, sensitive sites). We formulate and defend a response that is truly made-to-measure, at the risk of not being selected. Because of our proximity, MOX can clearly see all the complexity of a project and the budget targets that some clients try to minimise when going to tender. How does it work with other architects who find themselves confronted with the need for an external architect for site supervision on their projects? It is an area in MOX's business development that enables the company's autonomy. By diversifying the types of buildings and the projects they work on, MOX increases its expertise and technical knowledge, as indeed happens for an engineering consultant. It is a benefit both for MOX and for us. A means of broadening our respective site experiences. Does the fact that MOX originated in an architectural practice make architects look on it particularly favourably? They are interested in and curious about our initiative. They see it as a strategic choice adapted to the current context of their profession. It must be said that some architects often find it difficult to make the right choices on site which call their project into question and handicap them, to the point of paralysis. Certain architectural practices, such as MVRVD where I worked for a while, privilege their creative dimension and so systematically call on the services of executive architects for site phase. For that matter, there are some types of architecture that can allow for less rigorous execution, their conceptual power and their form concealing these faults. Yet other projects require perfect execution, where there is a certain sobriety, architectural minimalism, which would become a fiasco with anything less than excellence in execution. Hardel Le Bihan falls more into this second category. That is why we are interested in the site phase. There lies the difference between sobriety and poverty! How have the architects in the office felt about this new organisation? Internal communication around its launch and subsequent experience have revealed that some team members were apprehensive that they would be deprived of certain areas of experience, above all technical, which one acquires on site through contact with contractors. I think that in our new organisation, the architect follows their project through construction, but as a design architect, without having to take responsibility for its construction. This vision allows them to maintain and acquire technical knowledge. Each project is a new learning experience with regards a brief, technology, materials, constraints, without having to be confronted by the complexity of a site. The architect will continue to be concerned by the technical aspects of products and materials to be used. They will maintain their knowledge of the regulations and constraints that affect their design work. You have to separate the true intention at the moment of the conception – which includes everything as a summary of material and immaterial constraints – from controlling the final execution. This last is only a phase, albeit critical, of translation and adjustment at the scale of the site, where, among other issues, task sequencing must be addressed. The issues are thereby ordered in a hierarchy that is inevitably different from that at conception, with a whole different approach to the project. What's more, a new player gets involved at this last stage, the contractor, or indeed contractors, who then have to be convinced to work in synergy. The value of this organisation resides in the development of the partnership formed by the concept designer and the person responsible for construction. We all know each other, we work side by side. At Hardel Le Bihan it is important that a close relationship is formed between the conception project leader and construction project leader. They mutually enrich each other with their respective skills. The former opens the latter's eyes even wider to architecture, even when that person is not an architect. On that matter, what is the ideal profile looked for by MOX? We look for architects who are passionate about site phase, seeing their role in the design team on the coordination between the various packages and the careful fine-tuning of realisation; not necessarily very experienced, but displaying a sensitivity to detail, common sense, and the ability to explore technical subjects. We also look for engineers trained in site management. Finding the right people is difficult at the moment now building activity has picked up, particularly as the sort of skills we are looking for in people are also those sought by engineering consultancies and even client bodies who are also restructuring! Has your new organisation enabled Hardel Le Bihan to – successfully – go for bigger projects, such as those of Réinventer Paris? 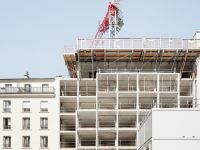 At Place du Grand Ouest in Massy, we are one of three practices (Hardel Le Bihan, Nicolas Reymond, Michel Guthmann) to have been retained on one urban block. We have proposed to the client, who is on the point of accepting, that MOX be appointed as sole executive architect. The two other practices wanted to hold onto architectural validation, not having the same proximity to MOX enjoyed by Hardel Le Bihan. This would enable the client to avoid having to attend three site meetings every week, instead giving them a centralised and optimised overview of site operations. On larger projects, where it is inconceivable that a single executive architect could be retained, we have already considered partnering with other organisations. In that instance, MOX would put the emphasis on the architectural and technical coordination, and our partner on the site management.